The brief of this competition was to design a four lane bridge in such a way that it could at some time in the future be expanded by tracks for a tram line. In addition, the new structure should proclaim the approach to the city over the River Oker, which previously was hardly perceptible. 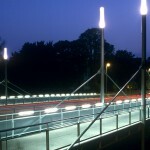 Our design envisaged the expansion, not in terms of a direct widening of the bridge, but instead separated pedestrians and vehicles on three distinct bridges with the option of using the intermediate space to add two traffic lanes, which would then reduce this intermediate space to just an interstice to admit light. 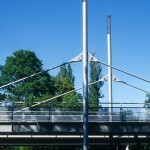 The pedestrian bridges as simple cable-guyed bridges, are subject to tension forces; announce the entry into the city, whereas the motorized traffic bridge, as a reversal of the pedestrian bridges, is subject to compression forces and best reveals its construction when viewed from underneath. 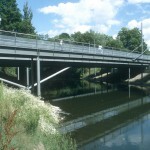 The quality of the design results from the clar-ity of the complementary bridge constructions and from the quality of the clear space below the bridge. It means that a path along the Oker obstructed by the former arched bridge can now be extended. 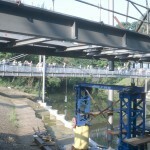 The experience of crossing the river is also heightened as a result of dividing the bridge into three parts. – Bauen + Wirtschaft. Hannover Braunschweig Wolfsburg 2004, Wirtschafts- und Verlagsgesellschaft (Worms), S. 46 f.
– AW Architektur + Wettbewerbe 03/2001 (Stuttgart), S. 64 f.
– wettbewerbe aktuell 12/2000 (Freiburg i. Br. ), S. 19 f.